EPC Group’s wide-array of experienced in the manufacturing sector can assist your organization in architecting and developing a solution that will meet the exact business and technology needs of your organization while also gaining enterprise-wide user adoption due to its engaging framework and content. Drawing from EPC Group’s 15+ years of experience, we will provide you with a solution that users will be drawn to and view as productive and useful by implementing its underlying features and functionally with usability in mind. Engaging with EPC Group ensures you are working with a seasoned partner who is not going to have to “reinvent the wheel” but rather pull from past experiences and lessons learned via our “from the consulting trenches” methodologies and understands the key elements that must be put in place to achieve success. 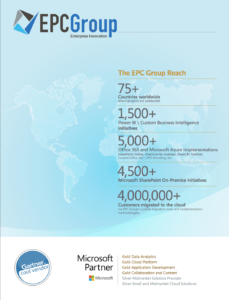 Engaging with EPC Group ensures you are working with a seasoned partner who is not going to have to “reinvent the wheel” but rather pull from past experiences and lessons learned via our “from the consulting trenches” methodologies and understand the key elements that must be put in place to achieve success.